Modrall Sperling shareholders Lisa Mann, Jennifer Anderson and Samantha Adams have been selected in the inaugural edition of the Top 250 Women in Litigation by Benchmark Litigation. The guide honors roughly 250 female litigators in all 50 US states, plus the District of Columbia, for their achievements in the field. Lisa Mann has an active civil litigation practice representing business clients in complex cases in both state and federal courts. Lisa regularly defends corporate clients in insurance bad faith litigation, including class actions, and also represents corporate employers defending against claims of discrimination, wrongful termination, breach of contract, sexual harassment, and retaliation. Jennifer Anderson focuses her practice on products liability, employment, class actions, mass torts, insurance, healthcare and commercial litigation. She regularly advises businesses and individuals on issues related to employment disputes, contracts, negotiations, medical malpractice, product safety, professional liability, and fair debt collection practices. Samantha Adams practices primarily in the areas of commercial litigation for business, government and non-profit organizations. Her experience spans the insurance, employment, education and health care industries. 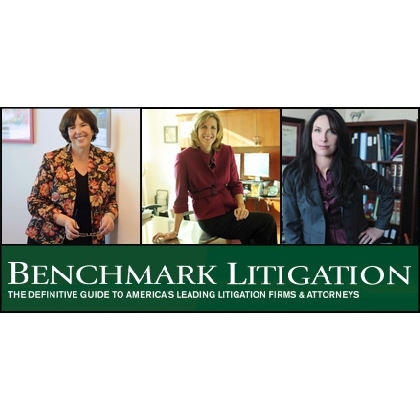 The publication is available online in PDF format at benchmarklitigation.com.